If you have iron – deficiency anemia, you should be aware that it is easily reversible by eating the right kind of food. You might know this leafy vegetable from the popular cartoon Mr. Popeye. Any time he needed strength; he’d pop open a can of spinach and gulp it down. 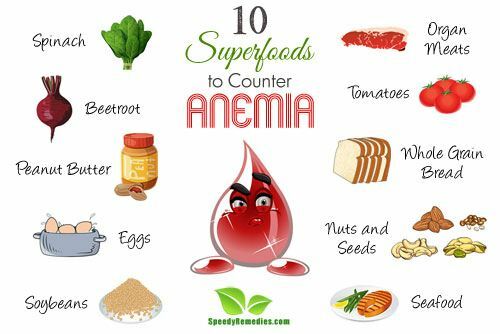 While you don’t have to fight off evil villains lurking around corner, you do have to fight anemia. And spinach is exactly the food to help you do it. Spinach, apart from being a rich source of iron, also contains calcium, Vitamins A, B9, E and C, iron, fiber and beta carotene which will help you improve your overall health. You can increase the amount of spinach in your green leaf vegetable salad or boil some spinach leaves in a cup of water, add some seasoning and make it a soup. Beetroot contains so much iron that eating beetroot daily for short periods of time can combat iron – deficiency iron. Apart from increasing your level of hemoglobin, beetroots helps in relieving constipation, reduces cholesterol levels, increase the level of antioxidant enzymes in the body, as well as increase the number of white blood cells, which are responsible for detecting and eliminating abnormal cells. Would you believe it? Your all time favorite PB&J sandwich could actually help with anemia. Peanut butter is a good source of iron and just 2 tablespoons daily would be enough to combat anemia. Just load it up on two slices of bread, add your favorite condiment (jelly/jam) and have a filling snack between meals. If, by some weird chance, you don’t like the taste of peanut butter, you can substitute it with a handful of roasted peanuts. Keep some with you at work and pop them as your work. Eggs are a great food item for your overall health. They contain very little calories and are a source of proteins and good cholesterol while also containing loads of vitamins and minerals including iron. An average sized egg is said to contain 0.6 mg of iron while a large egg contains 1 mg of it. Eating one egg daily is sufficient to compensate for your iron deficiency. You can eat boiled eggs in breakfast or poach or scramble them – there are a million ways to inculcate eggs in your daily diet. They are a good source of protein and will keep you powered till late afternoon. Soybeans are the richest source of iron in vegetarian category. They are in fact the main source of iron for people who do not eat meat and other non – vegetarian food. Soybean is a low fat and high protein food that fights anemia but to get the maximum benefit out of it, it is important that you cook it right. You need to soak the soy beans in warm water overnight to reduce the phytic acid in the beans. Phytic acid occurs naturally in the beans and interferes with the absorption of iron in the body. Organ meats are extremely nutritious, containing high amounts of iron. Meat from the liver of chicken, pigs and cows are a good addition to your diet if you are looking to fight anemia. Other types include kidneys, brain and heart. But while they are a good source of iron, including them in daily diet might do more harm than good as they also contain high amounts of saturated fat and calories. Ideally, once or twice a week is good but anymore than that would have to take into consideration your overall health. If you are suffering from a heart disease or are overweight, then maybe organ meat is not a good idea for you. While tomatoes themselves contain very little iron, they are rich in vitamin C which helps in the absorption of iron. It is anyway hard to ingest sufficient iron but what makes matter worse is that our bodies are sometimes unable to completely absorb the iron found in foods. Vitamin C helps our body absorb iron per unit energy. This is due to workings of ascorbic acid that prevents the formation of insoluble and non – absorbable iron compounds in your body. Apart from vitamin C, tomatoes also contain beta carotene, fiber and vitamin E – all of which are great for your overall health. It is recommended that you include one raw tomato in your diet for daily consumption. You can add it in a salad or just eat it raw, sprinkled with some seasoning of your choice. One slice of whole grain bread is said to contain about 6% of the daily required iron or your body. It is a very good source of non-heme iron and will help the body to fight deficiency of iron effectively. You can replace your daily white bread with whole grain bread, eating at least 2 – 3 slices daily to boost your iron levels. Some might think that because whole grains contain phytic acid it might inhibit iron absorption but since whole grain bread is prepared through fermenting process, the phytic acid inhibitors in the grains are significantly lowered. Plant-based proteins, such as nuts, seeds and beans all offer significant amounts of iron. People can consume a variety of nuts and seeds such as pistachio, apricot and pumpkin seeds to get high iron. Also, plant-based sources of iron contain lesser calories and more healthy fats. Therefore, they may be a healthy option for a person struggling with weight or at risk for heart disease. You can for a handful of pistachios, which are the best source of iron as it contains 15 mg of iron in 100 grams of nuts. You can also mix them up with apricots. In addition, pumpkin seeds are also good for fighting anemia. They also contain vitamin K, zinc and manganese and are among the best sources of magnesium, which many people are deficient in. The advantage nuts and seeds have over foods is you can have them on the go. Just fill some up in a small plastic container that you can store in your bag and keep popping them during your commute or while you are working. Sea food is known for its many health benefits. It is good for your heart, promotes good cholesterol and fat and contains loads of nutrients. Popular fatty fish like salmon, tune as well as other seafood items like oysters and clams are a great source of iron and can significantly improve the iron levels in your body. It is said that pacific oysters contain 7.2 mg of iron per 100 gram servings while shellfish contains heme iron which your body is able to absorb more easily. Try to include fatty fishes or seafood at least three times a week to help in preventing anemia. You can take roasted or baked salmon thrice a week to boost iron levels in your body.